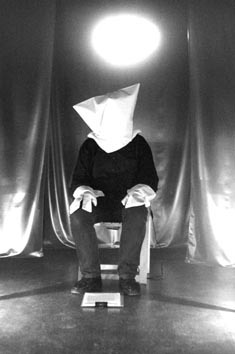 Performance duration 6 hours - Prema Arts Centre, Uley, Gloucestershire, UK. The work emerged in the gallery on December first as an installation and a six hour durational performance. A collection of chairs placed in an oval arrangement as if set around a large dining table. Each person would be given their time to speak, to tell their story, through my retelling of it. I sat at the head of the table, being the fourteenth guest and host. The stories began to my right, I moved from chair to chair giving voice in sequence to each persons stories. Also alongside each chair a small collection of objects was arranged. These were objects that had association for me with each person, or that they had given to me; a book, a map, a bottle of Eau de Vie, some condoms, an act up button and t-shirt, four safety pins, some sand, some soap liquid, a pair of leather chaps, some ox blood DM shoes, a red carnation, a letter, a drawing. On the back of each of these chairs was a clipboard each with three sheets of paper, a typewritten story on each sheet; thirty nine stories in all. An additional oval of 13 chairs was arranged one behind each of those in the main group. Hung on the back of each of these chairs was a clipboard with five sheets of paper and a pencil. These chairs were intended to accommodate the audience, and in this way they would provide an opportunity for visitors not only to watch and to listen, but to contribute their own stories by writing on the blank sheets of paper. Over the course of the day I moved from one chair to the next telling the stories, imagining the conversation, remembering my friends, honouring their everyday and extraordinary lives.